Disabilities can be challenging in all aspects of life, whether working, at school, shopping, or just taking public transportation. The Americans with Disabilities Act (ADA) strives to bridge that gap by ensuring common ways of living are accessible to all people. Now, with virtually everything actually being virtual, the ADA is working to ensure websites are compliant as well. Not unlike the Internet itself, the ADA’s take on making websites compliant has grown tremendously since its inception in 1990, and particularly in the last year. While rules were originally only enforced for businesses that were selling goods or services online, in addition to their storefront, it has now expanded to include basically all businesses. Perceivable – ensuring all texts and images can be perceived by any audience. This means all images need to have the proper ALT tags explaining what the image is so someone who is vision impaired can understand what is on the page. Making text larger should not affect the readability of your page. Operable – components should be operable and not difficult to navigate. Also, make sure no content on the page is prone to causing seizures with flashes or bright lights. Understandable – all content should be easily understood. There should be a component for pronouncing words that are difficult. Robust – content should be robust. This means that content must be robust enough that is can be interpreted by a wide variety of users and assistive technologies. There are a number of assistive technologies that help vision and hearing impaired users as well as users with limited motor skills. 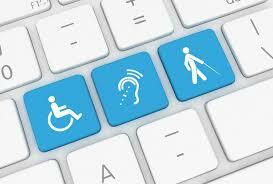 There are a lot of measures that can go into ensuring your website is ADA-compliant. In a very simple overview, the main things you want to focus on is ensuring your website is easy to navigate, having toolbars to find content, utilizing text to describe all images, and not having anything too flashy or distracting. If you are still unsure, reach out to us at Beach City Design and Marketing in Long Beach, CA. We are happy to help. You can contact us online or give us a call at 562-274-3790. ADA compliance isn’t going anywhere; let’s get started today.